Heather always wanted to be a cook but her mother stopped her because she did not want any daughter of hers to go into domestic service. Heather did shorthand/typing training but later in life fulfilled her dream by becoming a cook! I was born in Lessingham. I can remember when there was just me and I can remember the brother coming along and I suggested that he had a boiled egg for his tea when he was born. I was always told about that one. We had a very happy childhood. No money but we had a good mum and dad and they both looked after us and loved us. I can’t ever remember being ill treated – I mean you used to get a smack on the back of the legs if you were naughty. And I remember once telling on my brother when he swore and my Dad gave him a hiding! Naughty! My dad drove a troshing engine as we say in Norfolk: a threshing engine and later on he drove a steam roller. He used to park the threshing engine outside the house and I was frightened to look out of the window cos I couldn’t bear the sight of it: I was really frightened of it. It had a tall chimney and he used to put something on the top which I always called a tea strainer. He’d move it on the next morning when he went to work on the next farm and pick up the gear wherever that was and they had a straw pitcher, a drum and sometimes a water cart behind (because the thing went on water). In the village I knew all the people and we had a shop, a school, a church: we shared our church with Hempstead where there was another church. And we only had the one vicar, or rector he was, all the time. I started off at church when I was three. And I’m still going. I went to Sunday School and I used to get a book full of stamps and get a lovely prize at Christmas – a nice book to read. 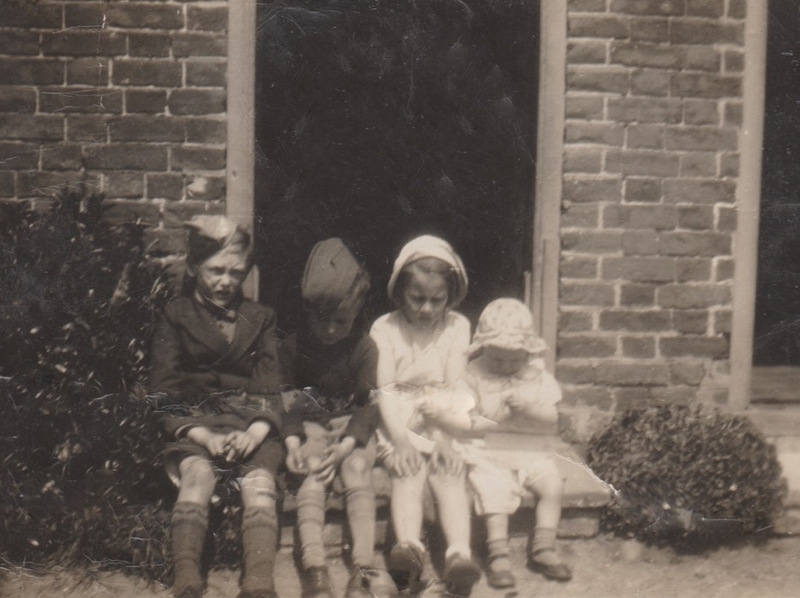 My house was – we went in straight off the street, in the front door right into the front room and through the front room was a little scullery. And then over the back door my dad had built a shed where we used to keep our bikes. The house had the coal shed indoors, next to the fireplace. And then beside that was the door going up to the stairs to the bedrooms. We only had two so I don’t quite know how we managed for 20 years. But we did. I had the one brother. That was the planned family. But then along came my sister when I was seven and then Mum had a son when I was 17. Quite a big family but there were bigger ones. Children used to walk from Eccles to Lessingham school. We didn’t have a bathroom. On Friday nights we used to have a big bath in front of the fire. Mum used to light the copper up which was a big water receptacle with the fire underneath and we used to fill the bath from this. We used to have a bath in front of the fire and all our clean clothes would be hanging on the guard in front of the fire. Clean pyjamas for that night and there was clean knickers, socks and vests and things for the next day. And we’d also have our hair washed in the bath. Wonderfully clean weren’t we? And the next morning my mum and dad would lift this bath over into the garden and Father used it to water the garden. So nothing was wasted. We did have electricity but not everybody did. We were the only two to start with. There was a farmer up the road who had electricity. They offered to put it in for nothing so my mum went for it and I’m sure I remember her saying that to start with they only had it downstairs but I can’t ever remember that. I can always remember having light switches upstairs. So whether that was true or not I don’t know. As for the toilets: oh gosh! Half a mile up the back garden! We had three wooden ones in a row and ours was the middle one. When the houses were first built they had shared toilets. There were three, a brick one at the end and a brick one there and another brick one. So we all had one each. I can’t ever remember sharing the toilet. But we used to get in there and then when we knew somebody was in the next one, we’d knock on the wall! They couldn’t be flushed. Father used to have to lift this big wooden lid up and pick the bucket and take it across the main street onto the garden which was the other side of the road from the house. There are now bungalows built there. So I hope their gardens are good. Father used to make sure he’d got a trench ready and that would all go in there. I know! Think of the smell! I was five in the May and I have a feeling I started school in the January. Could have been the Easter but I’m sure I started in the January and I was only a little, tiny thing. And I had a pale yellow jumper on and a ribbon in my hair and that is all I can remember so I should think I had a skirt on and socks and shoes! I can remember being in school and I can remember reading about Chicken Licken and Foxy Loxy. I remember one awful thing in the school. 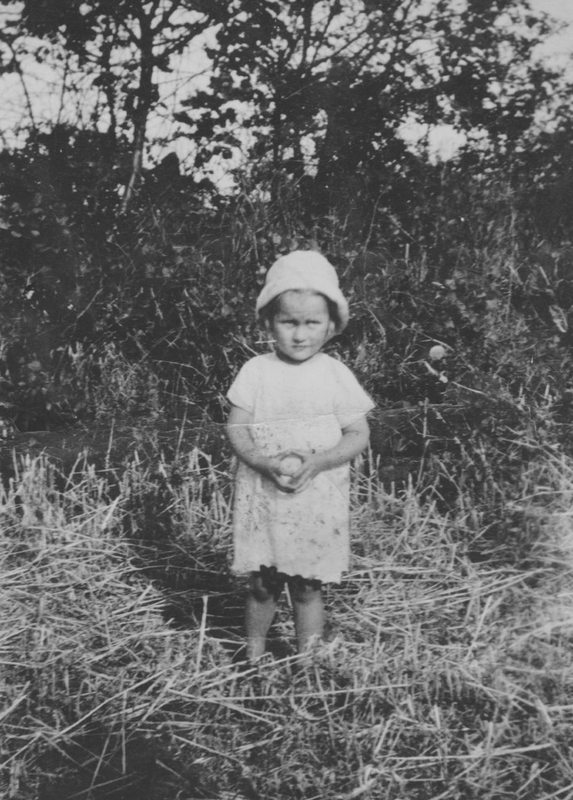 I used to wear brown, woollen stockings and my mother had darned the knees. And I suppose now that would be called bullying but these girls used to tease me and call me ‘Old darnd-o’ and when I told my mum all she said was, ‘Well, tell them it’s better than holes. I do remember that. We would play outside with balls, skipping ropes, hopscotch, but we didn’t have hoops and sticks at the school but we did outside. We used to have a long skipping rope tied to the railings and we’d all jump in. We used to have drill, it wasn’t called P.E. then. We had it outside in the playground and that was jolly cold. The teacher just used to take us all out in the playground and we used to do these sort of things you know. We’d all line up: shortest ones at the front, which was me. And that’s all I can remember about in the playground. That, and being laughed at about my darns. I was 14 when I left school. When I was 10 I went onto Stalham Junior School because my Mum thought that Lessingham wasn’t very good. But I didn’t pass the junior scholarship or anything like that. Two in our family did, and two didn’t. We had soldiers billeted to the area. They were down at Eccles at Spencer House. We had the Fifth Norfolks, the Seventh Norfolks and the Ninth Norfolks. I don’t know how I know that but I do. And they always used to parade on a Monday morning and they’d go right round by Happisburgh and down through Lessingham Street and I remember I [my mum] always used to be looking out of the window at them whether she’d see anybody she fancied or not, I don’t know! After the war, things didn’t change very much at all apart from the fact there was no danger of air raids. I remember during the war we used to go into the house opposite. A great big old house, used to be a pub. Hill House. And we used to get in one of the central rooms and the old Granny used to be there in bed and we’d be all sitting around when the Blitz, the Norwich Blitz, was on. But that was a good place to be because the man of the house always used to come in and bring his shovel with him. When it was all over, he’d go out and have a look round and say, ‘I think it’s alright now‘ and we’d go across the road and come home and go back to bed! We weren’t allowed on the beach. It was all coiled, barbed wire right along the coastline. We knew one of the coastguards who knew a way onto the beach where there weren’t any mines. And I remember him taking us over there one Sunday night so we could have a look around. He shouldn’t have done that I know but he did. We couldn’t play on the beach. We were alright this side of the barbed wire but, course you couldn’t go on the beach. Not until just before the war ended I think it was. We were allowed on part of Happisburgh beach. Well, it used to get crowded ‘cos everybody went down there but that part of the beach at Happisburgh is now all gone – eroded. I went to a private college to learn shorthand and typing and double-entry book-keeping. I did six months there. Actually I did seven because that was the very hard winter of 1947 and the buses couldn’t get through so I didn’t go for nearly a month. But they allowed us another month on the end. When I left there I wanted to work in Wroxham which was halfway to Norwich and I went to the Wroxham Labour Exchange which I don’t suppose they’ve got now. And they told me of a job that was going and I went there and I was there for six years I think. At the Wroxham job I did letters, book-keeping, making the tea for the workmen in the garage, whatever they wanted doing. I was general dogsbody really. I’d go to work on the bus every day, apart from Good Friday. I had to go to work but the buses were Sunday service on Good Friday so I had to bike which was about nine or ten miles but I thought nothing of it. My wages were 25 shillings a week. And fourpence for insurance so that I got 24 and eightpence. I had to think then. And my mum had five shillings off me and I also remember the first week I said, ‘that’ll spoil my pound.’ So she let me off the four and eightpence for the first week! But after that I had to pay five shillings! And then I think every year I got a half crown increase which is about 12½p in today’s money. I got my next job cos I’d met Arthur and I was engaged and this job came up in North Walsham at the canning factory (which is now no more) and that was the same sort of thing. 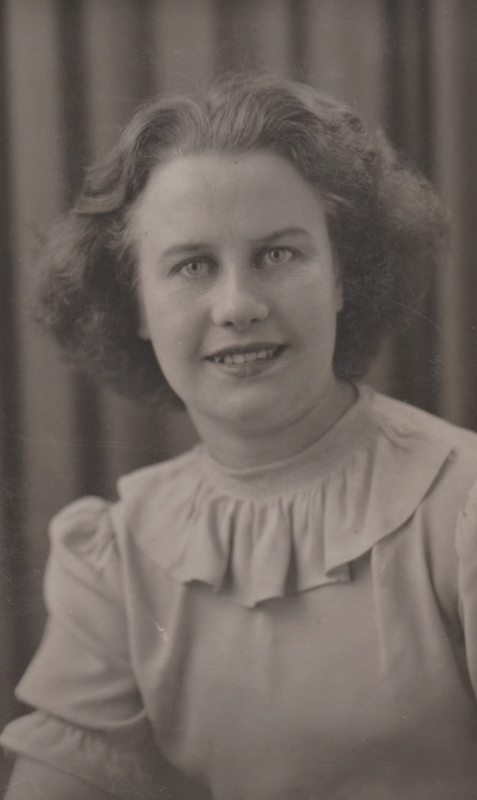 But when I got there I found out it was only a summertime job so after that I went to a local builder’s in Stalham: Tooley & Youngs (which is no more) and I still did the same sort of work but I did take on the telephone switchboard there and I was there after I got married in 1953. Then we got this house in North Walsham so we were busy moving in and decorating and all the rest of it. We lived with my husband’s people for six months and then I went to work on a fruit farm down at White Horse Common: just down the road. And doing the same thing, but then there wasn’t really much office work to do so I used to do fruit picking and all that sort of thing. And I left to have Jenny. I didn’t work any more until my son was a year and eight months I think and I went back to the local factory but this time in the factory we used to do a shift from six at night ‘til ten. So, as my husband walked in the house, I walked out. And then I went to the local potato factory, grading potatoes. All these jobs because they fitted in with school and the children. After that I went to Baxter’s Butchers where I used to deliver the meat. Went to Knapton and a dog bit me in Knapton! I always remember that. I passed my driving test in about 1967 or -8. But I passed my test and that was the same day that we went onto natural gas so I always remember. I was hoping to move into cooking. I wasn’t able to go into cooking after school cos my mother didn’t want any of her daughters to go into domestic service. See, my mum was an undergraduate from Reading University. She had high hopes. ‘No daughter of mine is going into domestic service.’ But she didn’t work: she just looked after us all the time. My father, I think like all fathers at that time, he didn’t really have a lot to do with our further education. So, I went as a shorthand typist at Martin’s Business College on Prince of Wales Road. Cooking was my first love. I can remember as a small child cooking meals for my rabbits! I used to chop all these leaves up for the rabbits and that was my cooking. I also remember taking a load of jam jars out of my mum’s pantry and picking elderberries from the back garden and crushing them all into these jars to make jam. My mum was not best pleased. So, I went for an interview at Crane Fruehauf. They wanted somebody to help butter the rolls for the morning break so I went to do that and I did that for about five years. Then we got bigger and we got more men coming in to the canteen so I was asked to be assistant cook which I did: custard and the gravy, all those sorts of things and then when the cook left, retired, I took her job. We had another lady come in as a manager and she then left and I became the Cook Manager. And that was where I finished up and finally left work on January the 29th 1988. I still cook. I still make cakes: sausage rolls are my speciality so I’m told. But we have cake stalls at the local church and that is in Hempstead and Lessingham. If we have a coffee morning I make sausage rolls and cakes, jam, marmalade, chutney… I just love doing it all. Heather Willey talking to WISEArchive on 19th January 2018 in North Walsham.